This week’s issue of The New Yorker, the one with the instant-turnaround purple rain cover, has two pieces I highly recommend in categories the magazine is best-known for. Ian Frazier writes deep-dive articles in a folksy voice in the department called “Our Local Correspondents,” and this week he covers an issue near and dear to my heart: “The Bag Bill,” focusing on activist Jennie Romer and her campaign to reduce the number of plastic shopping bags we use because they do substantial environmental damages. Meanwhile, Eyal Press contributes “Madness,” a wrenching expose of how mentally ill inmates in Florida are routinely tortured. But the week before that was an especially good issue. Aside from Hilton Als’s piece about Maggie Nelson (which inspired me to go out and buy her book The Argonauts) and Ariel Levy on the delightful eccentric artist Niki de Saint Phalle, the issue contains one of the most important political news stories I’ve read all year. Ben Taub’s “The Assad Files” is a long, strong reporting piece about the Commission for International justice and Accountability, an independent investigative body founded in 2012 by American lawyer Chris Engels which has been collecting hundreds of thousands of top-secret documents tracing the mass torture and killings directly to Bashar Al-Assad and his regime. The first-hand accounts are horrifying and upsetting to encounter. The situation in Syria is so bad and so hopeless, who knows when and how it will ever be resolved. If there’s any good news in this story, it’s that whenever the moment comes to prosecute Assad in the International Criminal Court, there will be no lack of evidence for his responsibility. “Road Warrior,” Jane Kramer’s in-depth up-close-and-personal profile of Gloria Steinem, which increased my already high regard for the feminist icon exponentially. “Drawing Blood,” in which reporter Adam Shatz introduced me to French-Arab cartoonist Riad Sattouf, whose book The Arab of the Future I can’t wait to read. “Cold Little Bird,” Ben Marcus’s short story about a father struggling to adjust to the reality of his ten-year-old’s son personality change. critical essays by Alex Ross and Hilton Als on two artists near and dear to my heart, Laurie Anderson and Sam Shepard (Hilton was kind enough to reference my Shepard biography in his review of the Broadway production of Fool for Love). 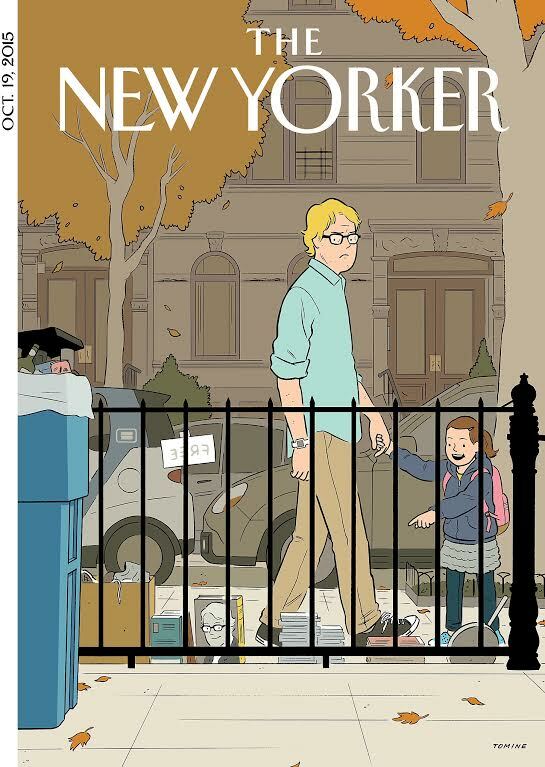 Not to mention Adrian Tomine’s cover image (above), which will induce groans of recognition from many writers who live in NYC.